Content plays an important role in the digital marketing of the company. The best websites today are categorized by easy to use content management systems. The flexible and user-friendly content management system allows the user to make changes to a website without touching a single line of code. A good content will always attract the user and promotes the business sales. WordPress, Drupal, and Joomla, all are open source free software licensed under GPL. It all offer great features, ease-of-use, tons of customization, and strong security. A quick guide about the features and benefits of the Drupal vs WordPress vs Joomla Comparison is listed below. WordPress – WordPress is an ideal platform to launch fast, content-driven websites and it offers quick load times, high functionality, links to social media, ease to use and much more. The important advantage of using a customized WordPress site is simplicity and flexibility. Drupal – The most powerful and difficult content management system. Drupal web development benefits the organizations to address the requirements for secure and active online presence. WordPress is considered as the world’s most popular content management system. Despite its humble blogging beginnings, it is been used on over 40% of CMS-based websites that is 60 millions websites all around the world today. WordPress can be easily maintained and it doesn’t any technical knowledge to operate it. Drupal is considered as the best platform for web content management among global enterprises, governments, higher education institutions. It is a powerful, developer-friendly tool and it requires experience and expertise to operate the site. Drupal help to build the right tool to serve content management strategy. Anyone considering Drupal should have the basic knowledge of any PHP, HTML and other common web programming languages. Joomla is the second most popular and used CMS (behind WordPress). Most of the websites run on Joomla platform without any problems, and it doesn’t require technical experience to operate it. 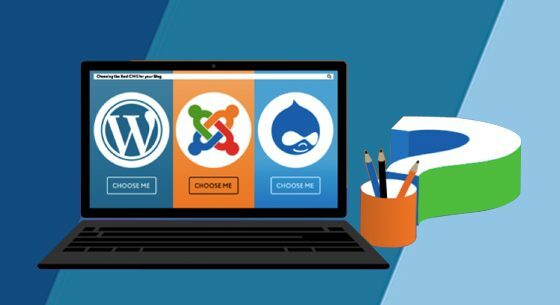 One of the major advantages of the Joomla is it has a lot of themes and plugins available to choose from (around 6000 plus) similar to both Drupal and WordPress. Joomla is flexible, users friendly and it has brilliantly combined the important feature of both platform. Many individual suggest content management system is the best. All three are excellent choices in most cases. All three platforms are free and each offers various third-party tools that add unique features to the site. Selecting the good Cms Development Company plays a crucial role in the company’s success. Select the best Cms Development Company and enjoy the popularity of the website.